First Line: "Why can't I just wear a dress I already own?" Maggie asked. Maggie Gerber's wedding to Sam Collins is finally going to happen. So what if she can't make up her mind about her dress or any of the other zillion-and-one details that revolve around this type of event? At least they've found their dream home in the historic district of St. Stanley! But it soon becomes apparent that all's not well in the house of their dreams. The lights flicker on and off. Doors slam shut or mysteriously open when no one's around. And something's scared the puddin' outta their cat, Marshall Dillon. When Maggie discovers a skeleton in the basement, she's positive she's found the reason for all the strange goings-on: their house is haunted by the spirit of a murdered man. She's determined to find the killer, but as she starts digging into the history of their house, she's going to find that someone is very willing to keep the truth buried. At all costs. There are three big questions in All Sales Final: (1) Why's Maggie dragging her feet over this wedding? (2) Who's the skeleton in the basement and who killed him? and (3) What's up with Maggie's arch enemy, Summer? Author Josie Belle (AKA Jenn McKinlay) answers them all in fine-- if a bit rushed-- style. Any woman who's marrying at Maggie's age is going to have some emotional baggage and some serious doubts, and McKinlay deals with these issues in a sensitive, understanding manner that fits the characters of both Maggie and Sam. A good deal of the humor in this book revolves around Maggie's enemy- since-high-school, Summer-- a character that I always found a bit over-the-top. Summer undergoes a bit of a transformation in All Sales Final that I found not only funny but believable. I mentioned above that I felt this book was a bit rushed. Several elements could have been developed more fully, but part of me understands why they weren't. This is-- sadly-- the last Good Buy Girls mystery, and fleshing out new characters or developing certain plot threads more fully would not stamp THE END on the story of Maggie and her friends. This entire series has not only been about good mysteries and good fun, it's been a wonderful celebration of friendship. I've laughed, cried, and just plain felt good reading about the lives of these characters, and I will sincerely miss them. 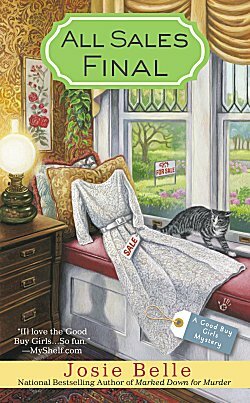 The Good Buy Girls mysteries form one of my favorite cozy mystery series, and I know I'm not alone in feeling that way. I think it's always tricky, Cathy, to balance the character development and so on that you want in a novel with the 'tie up the loose ends' nature that you want in a final novel. I'm glad that this one ticked most of the boxes for you. Oh no! I had no idea this was the last. I've really enjoyed this series. Thanks to you for turning me on to it. I did feel like it was a bit rushed, too, but I still enjoyed it. Darn, darn. Hate to know that I just said goodbye. It is sad. This is such a good series.